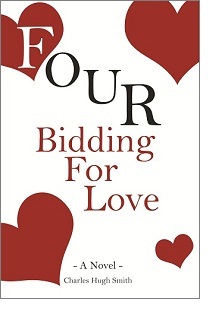 I have been laboring for years on a secret project--an escapist entertainment entitled Four Bidding For Love. The novel is being serialized in the old-fashioned manner of weekly segments, published every Saturday. Those who want to read the rest without waiting for the serialization can buy the story on Kindle for a small low-fat mocha coffee, i.e. $3.00. It is a cliche that writers write the book they want to read themselves, and it is undoubtedly true, for this is the kind of book I want to read at the end of a long and tedious day: a deliciously distracting romantic romp. How did I get myself into this senseless Hell? A huge bearded specimen of humanity stepped directly from Robin's worst fears onto the house's front porch, and brandished a gleaming hand-axe. His need for deliverance at fever pitch, he saw a slim chestnut-haired young woman in blue jeans and form-fitting blouse walk hurriedly up to the coffee booth and then slip off her sunglasses in a nervous scan of the patrons. Both smitten negotiators turned round and scanned the plaza, perhaps sensing the surveillance they could not spot. "Just to keep it interesting, let's say I demand not just this poster in exchange, but another toaster, too." "Can you help me out of this contraption? It's cut off the circulation to my arms and I've gone numb." Robin complied, and though he tried to avert his gaze, his attention was irresistibly drawn to her soft flesh, which reminded him most powerfully of Aphrodite come to life. Handing Kylie a slightly smudged glass of celebratory Chenin Blanc, Ross exclaimed, "I apologize for my lack of faith--you really are an extremely crafty negotiator," and at the last second thought better of adding, "and a very dear sweet girl." The trepidation of a second date is quite unlike the trepidation of the first, and in its own way, even more harrowing. For while both parties know within the first few moments of their first meeting if there is any spark between them, the second is fraught with a much greater uncertainty. Robin spotted Kylie standing outside the doors of the appointed cafe, and his heart rate leapt in anxious anticipation. Kylie returned home and parked her car just as the streetlights sputtered and went dark, along with all the lighting in the buildings lining her street. Over-riding his better judgment, Robin had turned his minivan off the approach to the Bay Bridge and driven to Kylie's rooming house. To say her face registered shock would be a fantastic understatement. Undetected by the blissfully engaged young lovers across the hall, the one candle Ross had failed to completely extinguish had flickered back to life, guttering wax onto a loose pile of papers on his desk. Water turns glossy pages into a pulpy sort of glue, and as a result all of Ross's magazine and catalog collection was irrevocably ruined. What turned Kylie's troubled mind was not the fire, but doubts about Robin--not just about him, but about herself, and the utterly inexcusable way she'd invited him to bed her on what was essentially their second date. Heaving a sigh, he bent down to pet Hanover the cat and then murmured out loud, "I'll have to tell her--but what if she says no?" "This is how friends treat you in your hour of desperate need," he scowled as Kylie drove away. "Dump you on somebody else." "How old is she, and how would you rate her sexiness?" Robin blushed warmly and then averted his gaze. "Early 30s, and very high." Alexia's hands were trembling, and she gripped the steering wheel hard. It had been a terribly traumatic afternoon, and she wanted most of all to reach the comforts and solitude of her own home. Dressed in a splendidly frilly scalloped lace white dress which played most prettily against her brown calves and contrasted equally prettily with her bronzed bare shoulders, Kylie was the picture of youth innocent of her own beauty. Given her keen anticipation of being home alone, Alexia did not welcome the lights on in her flat. While it is a romantic cliche that the avenue to a man's heart winds through his stomach, it is less acknowledged but equally true that the path to a woman's affections also runs through her stomach. Wrapping the large white towel around her, Alexia turned off the lights and flopped onto her soft pink comforter. As Ross gazed at the tousled blond hair of his bedmate and felt her warmth beside him, it seemed the world was indeed improving in leaps and bounds he could not have imagined just a few days ago. Under Ross's genial questioning, Alexia revealed her hope to acquire a huge horde of classic movie posters from a friend. The difference was so striking that Alexia wondered if she'd ever been with a man who was actually solicitous of her in the manner of R.T. If Alexia was like a winter bulb's first hesitant bud pushing up through the darkness of cool earth, Kylie was like a wild poppy turning its iridescent orange blossom gaily to the sun. Ross was putting the last hurried touches on the evening meal: spaghetti tossed with olive oil, steamed eggplant and parmesan cheese, served with plump scallops pan-fried in butter. Once the meal was consumed, events ran faster than either expected. Afterward, just when Ross thought his luscious bedmate had fallen asleep, Alexia turned over and nestled against him. A note of thanks to those who buy a book: As an independent writer, book sales are a substantial part of my income. I receive no funding from any university, trust fund, think-tank, shadowy C.I.A. front or government agency. Thank you for throwing caution and rationality to the winds and buying my work. You can easily download and read Kindle books on any device - no Kindle Reader is required. The free Kindle app is similiar to Adobe Reader, only it opens Kindle ebooks. You will quickly discover why most people love their Kindle readers/apps. 1. Select which device you want to read the book on, and click on the link below. This takes you to the Kindle app download page. 2. Click the "download" button. 3. When prompted, enter your email address. That's it! 4. Buy the book by clicking here. The ebook will open in the Kindle app, which is super-easy to use. Download free Kindle apps for all devices: Windows and Mac OS, iPads and iPhones and Android. You can also give a Kindle ebook as a gift. All content, text, HTML coding, format design, design elements and images copyright © 2013 Charles Hugh Smith, All rights reserved in all media, unless otherwise credited.